A regular breeding resident and migrant; the Cerulean Warbler was a rare species during the Minnesota Breeding Bird Atlas (MNBBA). The Cerulean Warbler’s breeding range is broadly distributed throughout the eastern United States, from Minnesota south to Arkansas and east through the Appalachian Mountains. Within this area, populations are very localized. The highest breeding densities are found in the Appalachian Mountains region of West Virginia (Figure 1). Assigned a Continental Concern Score of 15/20 and designated a Yellow Watch List Species by Partners in Flight; officially classified as a Special Concern Species in Minnesota and designated a Species in Greatest Conservation Need by the Minnesota Department of Natural Resources; identified as a Target Conservation Species by Audubon Minnesota. A long-distance migrant that winters in northern South America. A foliage gleaner that feeds largely on small insects. Open-cup nest usually placed high in the canopy of a deciduous tree. Breeding distribution and relative abundance of the Cerulean Warbler in North America based on the federal Breeding Bird Survey, 2011–2015 (Sauer et al. 2017). Aptly described by Bent (1953) as the “heavenly blue wood warbler,” the Cerulean Warbler is another southern species that began to extend its breeding range north along the Mississippi River in the late 1800s. Hatch (1892) collected the first specimen in 1869, presumably in Minneapolis. In 1885 Dr. Hvoslef collected a second specimen in Lanesboro, Fillmore County; and in 1898 a third specimen was collected by Mr. Gleason in Waconia, Carver County (Roberts 1932). Reports increased beginning in 1919 with observations in western Hennepin and Goodhue Counties in 1919; Houston, McLeod, and Olmstead Counties in 1924; and Meeker County in 1930. When Roberts published his treatise on Minnesota birds in 1932 he described the Cerulean Warbler as “a rare summer resident, breeding in the southeastern part of the state.” Despite an increasing number of observations, it proved quite difficult to confirm nesting of this high-canopy dwelling species. By 1932 no nests had been located, but in July 1929 a brood of three immature young were observed in Minneapolis. Sixty years after Dr. Hatch collected the first specimen, this was the first positive evidence that the birds were indeed breeding in the state. So much new information about this previously supposed rare bird in Minnesota has been gained in the last four years as to suggest that this species may have been overlooked (which seems unlikely in view of the many careful observers in the field), or that it has recently entered and advanced northward in the state in considerable numbers, a more probable explanation. What was most remarkable was that the new reports were not just of single individuals but of small, local populations. The first was from Linwood Lake in northern Anoka County. First discovered at the site in 1933, the birds were present during the summer of 1934 “in large numbers,” and by summer’s end four nests had been located in a hardwood forest dominated by basswood (Prosser 1934). Another small population was found in 1934 approximately seven miles west of St. Cloud at Grand Lake, Stearns County. In a letter to Roberts, Nestor Hiemenz wrote that as “many as fifteen to twenty singing males could be located in a single afternoon’s walk” (Roberts 1936). Hiemenz also had several records from other localities in the general vicinity of Grand Lake. In addition to these important records, Roberts (1936) noted that the birds continued to be observed in Goodhue County, Hennepin County, and on the Wisconsin side of the St. Croix River south of Taylor’s Falls. Then, in the mid-1960s, came reports from several northern locations: Mille Lacs County (Bolduc 1966); Crow Wing County (Roberts 1966); and Mahnomen County (Kelleher 1967). By the time Green and Janssen provided an updated account in 1975 they described the Cerulean Warbler’s breeding range as occurring “within a wide belt on both sides of the Mississippi River as far north as Mahnomen County.” New summer reports also were available from Douglas County in west-central Minnesota and Nicollet County in south-central Minnesota. Janssen’s update in 1987 noted a new nesting record at Maplewood State Park, Otter Tail County, in 1978 and the report of a pair observed at Flandrau State Park, Brown County, in 1985. He included a distribution map that identified 7 counties where nesting had been confirmed since 1970: Anoka, Goodhue, Hennepin, Nicollet, Olmstead, Otter Tail, and Scott. Hertzel and Janssen (1998) later added Brown, Dakota, Ramsey, and Winona to the list. Beginning in the late 1980s, field work conducted by the Minnesota Biological Survey documented a total of 138 Cerulean Warbler breeding locations. Confined primarily to the Eastern Broadleaf Forest Province, the most northern records were found in Becker County, southern Crow Wing County, and central Pine County. To the west they were documented in Otter Tail, Douglas, Pope, and Meeker Counties and, in the Minnesota River valley as far west as Brown County (Minnesota Department of Natural Resources 2017). In the early 1990s, attention began to focus on the Cerulean Warbler’s significant population decline. To address growing concerns regarding its status, a consortium of resource agencies and conservation organizations launched the Cerulean Warbler Atlas Project. For four breeding seasons from 1997 to 2000, field work was conducted to assess the extent of the species’ breeding distribution and to identify important local populations. During the course of the project a total of 103 singing males were reported in Minnesota at 57 sites. Of these, 9 sites had five or more singing males: Murphy-Hanrehan Park Reserve in Scott and Dakota Counties reported the highest number with 20 males; Lake Maria State Park and Stanley Eddy Memorial Park Reserve, both in Wright County, logged 16 and 11 males respectively. Other significant sites included Beaver Creek Valley State Park, Houston County (9 singing males); Seven Mile Creek County Park, Nicollet County (9 singing males); and St. John’s University Woods, Stearns County (8 singing males; Rosenberg et al. 2000). Beginning in 2009, MNBBA participants tallied a total of only 45 Cerulean Warbler detections from 33 surveyed atlas blocks and from 17 priority blocks. Breeding evidence was documented in 5 blocks (Figures 2 and 3; Table 1). The birds were observed in 26 of Minnesota’s 87 counties and were confirmed breeding in 6 counties: Brown, Goodhue, Le Sueur, Nicollet, Renville, and Winona; 2 blocks where nesting was confirmed along the Minnesota River each straddled 2 counties (Renville/Brown and Nicollet/Le Sueur). Although the Cerulean Warbler’s primary breeding distribution in the state appears unchanged since at least the 1960s, the number of MNBBA records certainly supports other evidence of a population decline. The records were sparsely distributed throughout the species breeding range. Only two areas, Murphy-Hanrehan Park Reserve and the Mississippi River floodplain in northern Goodhue County, had reports from multiple adjacent blocks. With its habit of dwelling in the high canopy and its thin, wispy song, the Cerulean Warbler is not an easy species for many observers to document, but experienced observers can readily identify the species in appropriate habitat. Like the MNBBA, the Cerulean Warbler Atlas Project also relied on a network of paid field assistants and volunteers to conduct its field assessment. As a result, it is likely that the significant decrease in detections noted between the two projects accurately portrays the species’ decline. Similar changes have been documented throughout the warbler’s breeding range. Although there have been few overall changes in the extent of its distribution in recent decades, its overall abundance has declined significantly. In the 1940s, the species was considered “really abundant” in Wyalusing State Park, in the southwest corner of Wisconsin. Although the park remains an important site, the Cerulean Warbler is no longer abundant there (Cutright et al. 2006). And the species’ decline was already evident when the first breeding bird atlas was conducted in Michigan in the mid-1980s. Originally common in southeast Michigan in the early 1900s, atlas records documented the species’ retreat to floodplain forests in the southwestern corner of the Lower Peninsula. By the time the second Michigan atlas was conducted (2002–2008), the number of townships with Cerulean Warblers had declined by 12% (Chartier et al. 2013). Similar changes have been noted throughout the warbler’s breeding range. Breeding distribution of the Cerulean Warbler in Minnesota based on the Breeding Bird Atlas (2009 – 2013). Summary statistics of observations by breeding status category for the Cerulean Warbler in Minnesota based on all blocks (each 5 km x 5 km) surveyed during the Breeding Bird Atlas (2009-2013). Summary statistics for the Cerulean Warbler observations by breeding status category for all blocks and priority blocks (each 5 km x 5 km) surveyed during the Minnesota Breeding Bird Atlas (2009-2013). In recent years numerous field studies have focused on understanding the warbler’s habitat requirements. During the summer, Rosenberg et al. (2000) stated it has a “distinctly bimodal habitat distribution,” with breeding birds evenly distributed between upland and lowland forests. Indeed, in southeastern Minnesota, the species is found occupying mesic forest slopes bordering small streams and in extensive floodplain forests adjacent to the much larger Mississippi and Minnesota rivers (Figure 4). Further north, in central Minnesota, the Cerulean Warbler is more commonly found in drier upland hardwood forests that are interspersed with small wetlands (Minnesota Department of Natural Resources 2016). During the Cerulean Warbler Atlas Project, habitat data were collected at 39 of the 57 sites in Minnesota where the birds were reported. Of these, 51% were classified as riparian, and 44% were classified as dry slope habitats. In the heart of its range in the Appalachians, the Cerulean Warbler is found on dry mountain ridge tops (Buehler et al. 2013). Regardless of the type of forest selected, all occupied habitats include tall, mature deciduous trees and a structurally heterogeneous forest canopy with approximately 85% canopy cover and scattered forest openings (Potter et al. 2007). Within the forest, the warbler is often associated with gaps in the canopy, particularly in larger, extensively forested landscapes. The Cerulean Warbler is considered an area-sensitive species, but the degree of sensitivity may vary across its breeding range (e.g., Thogmartin et al. 2004; Wood et al. 2006). Some studies have documented that smaller tracts are suitable in the north while larger tracts are required in the south (Buehler et al. 2013). In the Upper Midwest, however, the Cerulean Warbler Atlas Project found 65% of all records were in forests larger than 400 ha; less than 10% of the records were in forests less than 40 ha (Rosenberg et al. 2000). Yet, even within forest tracts that are highly suitable for the Cerulean Warbler, its distribution may be localized and patchy (Potter et al. 2007). Typical breeding habitat of the Cerulean Warbler in Minnesota (© Lee A. Pfannmuller). Federal Breeding Bird Survey (BBS) data were used to generate a range-wide population estimate for the Cerulean Warbler of 570,000 breeding adults (Rosenberg et al. 2016). In 2013, the population in Minnesota was estimated at just 500 individuals (Partners in Flight Science Committee 2013). Because it is a rare species that is dependent on large forest tracts not well surveyed by roads, the Cerulean Warbler is not adequately monitored by BBS routes in Minnesota. Indeed, from 1966 to 2016 it has only been detected 18 times on BBS routes in Minnesota: 12 from 1966 to 1975 and 6 from 1980 through 2004. None has been reported from 2005 to 2016 (Sauer et al. 2017). Of the 18 reports, 15 were from one BBS route (St. Stephen) in Stearns County, where the bird has not been reported since 1995 (Sauer et al. 2017). Sparsely distributed throughout its breeding range, Kentucky and West Virginia are the only states where the average number of Cerulean Warblers observed on BBS routes in the state each year is greater than or equal to 1 (Kentucky: 1; West Virginia: 3). 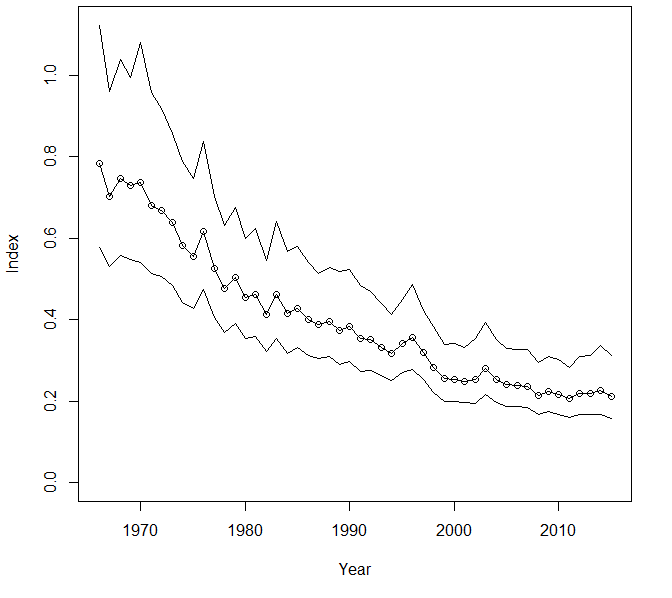 Survey-wide BBS data document a significant population decline, with numbers decreasing an average of 2.63% per year from 1966 to 2015 (Figure 5). Populations are either stable or significantly declining in every state within the warbler’s breeding range. Since 1970, biologists estimate that the population has experienced a cumulative decline of 72%, one of the steepest declines of any North American songbird (Rosenberg et al. 2016). The loss of habitat in both the breeding and wintering range of the Cerulean Warbler is considered the most important factor responsible for the species’ decline. Large tracts of mature forest habitat in the eastern United States are threatened by a multitude of activities including timber harvest, agriculture, and residential development. In the core of the species’ range, the most significant threat is coal mining, especially mountaintop mining that removes the entire summit or ridge to expose buried seams of coal. The forests on these ridges and mountain tops are the warbler’s preferred habitat (Parr 2007). Unfortunately, even when some of the forests are retained, their size and structure may be inadequate to meet the species’ needs. Forest fragmentation has been directly correlated with lower reproductive success (Buehler et al. 2008). Habitat loss is an equally important concern on the wintering grounds, where the conversion of the Cerulean Warbler’s montane forest habitat to agriculture is occurring at a rapid pace (Terborgh 1989; Robbins et al. 1992). Breeding population trend for the Cerulean Warbler in North America for 1966–2015 based on the federal Breeding Bird Survey (Sauer et al. 2017). The Cerulean Warbler is widely recognized by international conservation groups and resource agencies as a species in serious trouble. It is classified as Vulnerable by the International Union for the Conservation of Nature (BirdLife International 2015). Partners in Flight has assigned it a high Continental Concern Score of 15/20 and added the species to its Yellow Watch List, a group of 12 North American songbirds that require constant care to prevent further declines (Rosenberg et al. 2016). In 2000 a consortium of environmental groups, led by the National Audubon Society and Defenders of Wildlife, petitioned the U.S. Fish and Wildlife Service to list the Cerulean Warbler as a federally threatened species. The Service announced its decision not to list the species in 2006. Citing a national population size numbering over a half-million birds, it concluded that the species was not likely to face extinction in the foreseeable future (U.S. Fish and Wildlife Service 2006). Shortly after the petition was filed, the Cerulean Warbler Technical Group was formed in 2001 to identify and implement conservation actions to halt the species’ decline. An international collaborative formed of biologists and land managers from government agencies, conservation organizations, academia, and industry, the members of the technical group have outlined a set of specific strategies to address the information and management needs of the species (Dawson et al. 2012). One of the group’s efforts has been the development of a conservation action plan (U.S. Fish and Wildlife Service 2007) that identifies specific actions to address habitat loss and a variety of other limiting factors, including climate change, collisions, mercury contamination, and acid deposition. In Minnesota the Cerulean Warbler was officially listed as a Special Concern Species in 1996 (Minnesota Department of Natural Resources 1995) and is designated a Species in Greatest Conservation Need (Minnesota Department of Natural Resources 2015). Audubon Minnesota identified it as a Target Conservation Species and prepared a conservation blueprint for the species in 2014 (Pfannmuller 2014). Climate change models developed by the National Audubon Society predict that the core of the Cerulean Warbler’s breeding range, now located in the Appalachian Mountains, will gradually shift northward. Classified as “climate threatened,” the species could lose 98% of its current breeding range by the year 2080, shifting its current breeding range north into New England and the southern portions of eastern Canada. The conservation challenge is to ensure that the large, mature hardwood forests that the species depends on are available in these areas in future years (Langham et al. 2015; National Audubon Society 2015). Best management practices for Cerulean Warbler habitat focus on uneven-aged management of mature forest tracts that retain large, mature trees as well as vertical and horizontal diversity in the understory and forest canopy (Hamel and Rosenberg 2007). The Partners in Flight Bird Conservation Plan for the Upper Great Lakes Plain, which includes the Eastern Deciduous Forest Province in Minnesota, proposed a Cerulean Warbler conservation model designed to support known local populations (Knutson et al. 2001). Important parameters of the model included maintaining core blocks of mature forest habitat that are at least 700 hectares in size. Within this core the authors propose that at least 25% of the canopy trees should be mature trees greater than 20 m in height and 25–55 cm dbh (diameter at breast height); canopy cover should range from 65%–85%. Few people have the opportunity to see this tiny blue warbler as it flits high within the forest canopy. Unfortunately, its future is not promising, particularly in the core of its breeding range, where it has become the mascot of a major environmental campaign to halt mountaintop mining. Bolduc, Donald. 1966. “Northerly Record for the Cerulean Warbler.” Loon 38: 73. Buehler, David A., James J. Giocomo, Jason Jones, Paul B. Hamel, Christopher M. Rogers, Tiffany A. Beachy, Dustin W. Varble, Charles P. Nicholson, Kirk L. Roth, Jennifer Barg, Raleigh J. Robertson, Joseph R. Robb, and Kamal Islam. 2008. “Cerulean Warbler Reproduction, Survival, and Models of Population Decline.” Journal of Wildlife Management 72: 646–653. Dawson, Deanna K., T. Bently Wigley, and Patrick D. Keyser. 2012. “Cerulean Warbler Technical Group: Coordinating International Research and Conservation.” Ornitologia Neotropical 23: 273–279. Hamel, Paul B., and Kenneth V. Rosenberg. 2007. “Developing Management Guidelines for Cerulean Warbler Breeding Habitat.” In Proceedings of the 15th Central Hardwood Forest Conference, edited by David S. Buckley and Wayne K. Clatterbuck, 364–374. General Technical Report SRS-101. U.S. Department of Agriculture, Forest Service, Southern Research Station. Kelleher, Kevin. 1967. “Cerulean Warblers Nesting in Mahnomen County.” Loon 39: 108–109. Prossor, C. C. 1934. “The Cerulean Warbler.” Flicker 6: 63–65. Robbins, Chandler S., John W. Fitzpatrick, and Paul B. Hamel. 1992. “A Warbler in Trouble: Dendroica cerulea.” In Ecology and Conservation of Neotropical Migrant Landbirds, edited by John M. Hagan III and David W. Johnston, 549–562. Washington, DC: Smithsonian Institute Press. Roberts, Nancy. 1966. “Summer Observations of Cerulean Warbler and Lincoln’s Sparrow in Crow Wing County.” Loon 38: 142. Rosenberg, Kenneth V., Sara E. Barker, and Ronald W. Rohrbaugh. 2000. An Atlas of Cerulean Warbler Populations. Ithaca: Cornell Lab of Ornithology. Terborgh, John. 1989. Where Have all the Birds Gone? Essays on the Biology and Conservation of Birds That Migrate to the American Tropics. Princeton: Princeton University Press. Thogmartin, Wayne E., John R. Sauer, and Melinda G. Knutson. 2004. “A Hierarchical Spatial Model of Avian Abundance with Application to Cerulean Warblers.” Ecological Applications 14: 1766–1779. U.S. Fish and Wildlife Service. 2006. “Endangered and Threatened Wildlife and Plants; 12-Month Finding on a Petition to List the Cerulean Warbler (Dendroica cerulea) as Threatened with Critical Habitat.” Federal Register 71(234): 70717–70733. Wood, Petra Bohall, Scott B. Bosworth, and Randy Dettmers. 2006. “Cerulean Warbler Abundance and Occurrence Relative to Large-Scale Edge and Habitat Characteristics.” Condor 108: 154–165.